Editor's Note: I'm sure we've all got plenty of 'stuff' with the Carolina logo tucked away on shelves or in closet. For this series, David Staley –formerly of Carolina Water Cooler– offers us a peek at his collection and the stories behind these (sometimes) treasured objects. We are just days away from the return of football season. Let's kick it off (see what I did there?) with a cautionary tale that reminds you to never take your eyes off your children while attending a sporting event, shall we? Do you remember the scene in Home Alone 2 where Kevin is following his family as they sprint through the airport in an attempt to make their flight after over-sleeping (again)? He stops briefly to adjust his backpack or pick up something that he dropped or tie his shoe (the point is he stops and looks down, ok? ), and when he looks up again, he sees a man who isn't his father but is wearing the same jacket as his father so he winds up following him to the wrong plane. Suddenly his family is in Paris and he's in NYC. This could never happen today - they didn't scan his ticket to verify he was in the right place, they trusted a kid to point out his dad from several rows away...the whole thing is fairly unbelievable in retrospect. But realistic or not, the same thing happened to me. Except instead of being in an airport, I was exiting Kenan Stadium en route to my grandmother's church van. And instead of my dad it was my uncle. Other than that, exactly the same. Turns out, the whole thing could have been a movie and I could be as rich as Macaulay Culkin right now. Assuming Macaulay didn't squander all his riches as most child actors do, that is. I don't even remember exactly how old I was. I'm going to guess seven or eight. My grandma's church was taking the youth to see Carolina take on...let's say Duke or Wake. I think it was Duke, but I'm not sure. My grandma was not a football connoisseur by any stretch of the imagination, and my aunt, uncle, and cousin were all going with the group, so I was more or less under their supervision while we were gone. But it was a group with plenty of adults, so ultimately everyone was responsible for everyone to some degree. I've since learned in the business world that if everyone is responsible for something, no one is responsible for it. Anyway, it was a blowout and the drive from Chapel Hill back to Wilkes County (don't worry, I'm sure I'll address my Wilkes County heritage in a future post) isn't short, so midway through the 4th quarter the adults decided it was time to roll out. After a quick bathroom break, we exited the stadium. My uncle was wearing a beige jacket, so I followed him toward the church van. Or so I thought. I don't know exactly when I realized that the guy I was following was not, in fact, my uncle, and I don't know exactly when my aunt and uncle realized I was not, in fact, following them, but by the time any of us came to that conclusion, I was lost. This, I believe, was the first football game I'd ever attended in Chapel Hill, so I wasn't exactly as familiar with the campus as I am now. So I did what every intelligent, cool, calm, and collected seven or eight year old would do. I panicked. I started running around aimlessly screaming "Bert! Debra! Emily!" (Uncle! Aunt! Cousin!) They were clearly too far away to hear me. Oddly, no other adults thought it was odd that I was near tears and screaming at the top of my lungs for people who weren't answering. Or if they did, they didn't volunteer to help me. So I gathered my composure and decided to look for a police officer. I spotted what I remember now as a panel van type vehicle with something police related written on the side, though that may be inaccurate. For all I know, it was actually a news crew. But I do think the guys inside were wearing police attire. If I remember correctly, the van's sliding door was open, so I poked my head in and told them I was lost. The reason I question whether or not this was actually a police van now is because instead of helping me, they said "well, just go look for a couple of minutes and if you can't find your group come back here." Shouldn't they have been more helpful if they were actually cops? I mean, I'm lost with no clue where I am, but sure, I'll walk around for a bit and then find my way back to you? Right. Now, that being said, I do recall that they were both eating doughnuts, so maybe they were cops but they were on their break? So I kept moving. I don't know where I was. I remember going up and down some brick steps near buildings, which doesn't narrow down my location in any way whatsoever. Could have been a dorm, could have been a science building, could have been Davis freaking library. But eventually I came to a huge intersection with an overhead crosswalk, which I now know to be the hospital parking deck area on Manning Drive. There was a policeman standing in the middle of the intersection directing traffic, so I did what every intelligent, cool, calm, and collected seven or eight year old would do - I walked directly into the middle of the intersection and told the policeman I was lost. He sent me over to the sidewalk on a corner and told me to wait there until "one of his friends" could show up and help me. (Sure, it sounds creepy when I type it in quotes like that, but it was just his way of talking to me like a child and calming me down.) A couple of minutes later, a police car pulled right up beside me on the sidewalk. The policeman got out and escorted me into the front seat. He asked who I was there with, etc, and once he found out I was with a church group he immediately drove to what I assume was the designated "church van parking lot." Rows and rows of church vans. In hindsight, it was the S-11 lot down by the Dean Dome. He told me to look for my group while he slowly drove up and down each row. It didn't take long before I spotted the van and a group of worried looking folks from the church. I hopped out and the entire group thanked the police officer profusely - I assume. I was given a hero's welcome of hugs, a Coke (somewhere Roy Williams nods in approval), and a Snickers - I liked sugar and chocolate then and continue to have a similar diet to this day. Then someone set out in search of my aunt and a few other folks from the group who were off searching for me. Soon, they came walking back toward the van, practically carrying my aunt because she was so shaken and tearful. Side note: she now has a pacemaker which she claims was caused by this incident - though I do feel like my cousins played a role in that, as well. Just like that the whole ordeal was over, and we made our way back to the western part of the state. I'm not sure if Boiling Springs Baptist Church ever took another youth group to a football game or not. If they did, I wasn't invited. This entire near-tragedy/permanently scarring event could have been avoided if I had owned a Kenan Stadium replica at that point in my life. I guess that's not technically true, since what I really needed was a replica of the entire Carolina campus, but it kind of ties up this whole post nicely, so let's just go with it. The good news is, today I do own a Kenan Stadium replica, so this will never happen to either of my children. Of course, this replica is from prior to when the Blue Zone was built, so it looks completely different than the current stadium does now and probably creates more confusion with my children than having no replica at all. You know what, forget I said anything. 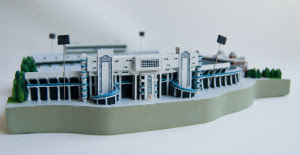 This miniature version of Kenan Stadium was produced by Collegiate Collectibles and is number 33 of the "limited edition" of 10,000 produced. I'm actually pretty impressed by that number 33 - that's quite low. Only 32 were produced before the one in my possession. It stands approximately 12" long, 10" wide, and 3" tall. I have no idea what type of material was used in its production - let's say porcelain. It's heavy. Is porcelain heavy? As far as appearance, it looks exactly like a tiny version of the real Kenan Stadium, circa 1998. It came with a wooden base on which to sit it, and the base has a little golden plaque on the front that reads "Kenan Stadium, University of North Carolina." I separately procured a glass case to go over the top for added protection (the lights are particularly fragile). Typically in this spot I'll compare the item I'm writing about to a former Carolina athlete or coach with a brief explanation of why the comparison is valid, but in this case I feel like I should just compare a miniature version of an item to the life sized version of the real thing. It just makes sense. As stated above, this miniature Kenan Stadium looks quite similar to the real thing. It was produced with impeccable attention to detail. The seats, the lights. This is not a cheap knock off sold on a street corner, it's a legit collector's item. Do you own a Kenan Stadium replica like David's? What's your favorite Carolina collectible? Let us know in the comments below! A collectible from a forgettable season. Finally, the sweet taste of an NCAA Championship (and a commemorative Coke).